Indian policies never allowed Kashmir to be a major player in infrastructure planning and liberalization. Skilled workers are the most gifted asset to any emerging super-economy, but for their development, education in finance, economics, technocracy, politics is needed so that our natives get training imparted with adequate skills. Until now, our modest and beautiful valley has been deprived of any major intellectual or economic revolution. Article 370 in the Indian constitution, which grants autonomous status to Jammu and Kashmir, has been the biggest flaw and impediment in bringing any social and economic change because it hasn’t been enacted. Leaders have a bigger role to play if they want to bring a revolution in how we live. So far, every elected leader has failed to fulfil his or her promises. Kashmir produces a variety of fruits, vegetables and grains, yet 40% of them rot because there is no or little advanced processing and packaging service available, thereby depriving people of thousands of jobs. But if our economy gradually changes from small-scale agriculture to low-end manufacturing to high-end manufacturing, it will change the fate of Kashmir forever. The Indian agriculture sector produces just 20% of the national income. Thus it is clear that tertiary sectors are the soul of economic growth. Indian agriculture sector produces just 20% of the national income. Thus it is clear that tertiary sectors are the soul of economic growth. Controlled and properly conducted regulatory industrialization through privatization will bear us fruits. But our so called “Special Constitution” drafted by a pack of naïve policy makers are giving us a hard time in changing course. Human resource development can never be achieved in a land or a nation where basic human rights are denied and don’t even exist on paper. How can we expect to develop our human resources when our youth are deliberately ill-treated and discriminated against in recruitment and education? Is there anything Kashmiris can do about this within the orbit of India subjugation and control? No! That is why all Kashmiris talk about politics. It is not that we are not aware of these issues but all these issues are directly linked to our political subjugation. Kashmir has the least privatized industrial sectors in India. What makes this a part of India’s subjugation policy towards Kashmir is the fact that this has been achieved by a consistent policy aimed at achieving a financial and economic dependence on India. For example JK Cements Ltd – Kashmir’s only profit making PSU – has been one of the most ripe for privatization but it has been denied due to the effect it would have on Indian control over Kashmir’s economic resources. Jammu & Kashmir Bank Ltd is another one: there is a large cry around the country about JKB’s stocks touching record highs. But most of the stocks are taken by India! Our literacy level is directly related to the impediments we face due to the absence of human rights. Kashmir is surviving because of self sustainable local businesses –thanks to rich cultural and historic heritage of Kashmir. There has been an increasing trend of Kashmiris migrating or hunting for jobs in the Gulf, America, Canada and UK. Recently a local channel stated that Kashmiris now run a carpet and ‘paper-mache’ business in Rome and Helsinki! Indian statistics won’t reveal that Kashmiris are the richest non-resident groups in India followed by Guajaratis, or statistics regarding huge reserves of granite, slate, marble, iron ore and sapphires which are literally being allowed to rot due to their attitude towards privatization. One of the most significant regulatory burdens in India is labour regulation which provides disincentive to grow businesses, reduces flexibility in operations and increases exit costs. India still lags far behind others in terms of GDP or human development. A research study by an international company stated that companies regularly find administrative compliances, complex taxation, poor infrastructure in developing and emerging cities and corruption considerable. The result is that India pays more to rivals to produce, distribute and export goods. 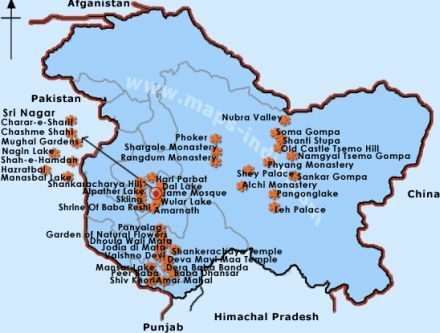 If we compare areas and cities of Kashmir with Indian emerging cities, we stand absolutely nowhere! It’s an alarming situation we are facing right now. But the greatest irony is that the Indian laws are only for the protection of labourers in an organized sector, but even then some Kashmiri people usually work on low wages, find no work, and get involved in brawls due to unfavorable atmosphere in various parts of India. Some modest Kashmiris also face terrorism charges. Many students who want to pursue higher education in India are deprived of admission due to their birth place. Some recruiters crack jokes: “You were born in a wrong place”. No matter how many false dreams are aired on public television or how many new economic packages are being allotted to Kashmir on paper, the fact is that Kashmiris are not a part of their own economy by design. They cannot create more jobs, more assets and more revenue generating units to the fullest of their capabilities because they are not involved in their own economy. Our own banks don’t belong to us. Our profit making PSU belongs to the Government of India. Our hospitals depend on central grants for upkeep and infrastructural development. Our best schools are managed and controlled by missionaries who have absolutely no interest in the bigger political conundrums of Kashmir. We need a new approach in dealing with the economics of Jammu & Kashmir. Corruption is literally choking every service sector, and impeding economic growth. We have to develop adequate infrastructure with proper planning and resource management. Otherwise, we will find ourselves in a ruinous economic crisis, which would create dangerous reactions in every section of our society.